PlaqueOff Cat is a patented natural feed supplement containing only especially selected seaweed. When used daily, it is clinically proven to significantly reduce bad breath, plaque and tartar. 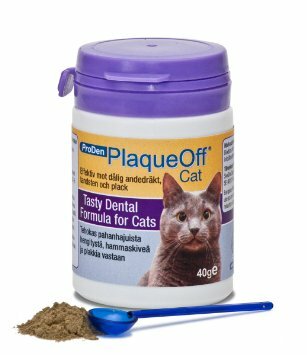 PlaqueOff Cat 60gm PlaqueOff Cat continues to deliver all the benefits of Plaqueoff but has been specially formulated to appeal to our feline friends with a more discerning palate. By adding brewer's yeast, an ingredient which cats love, to the specially selected seaweed, PlaqueOff Cat has proved irresistible to a panel of cat critics. Contains approximately 6 months to 12 months supply (depending on the weight of your pet) Daily amount according to the weight of the animal, once per day. Add to wet or dry food Brewer's yeast, an ingredient which cats love, is added to the especially selected seaweed (D1070).